What the Heck is he DOING !?! There is no secret, no magic formula to nighttime photography. All my night shooting is done within four nights of the full moon. The moon rises at sunset (plus or minus a few minutes) on the evening of the full moon. The day after the full moon, moonrise is approximately one hour after sunset, two days later means moonrise is two hours after sunset, etc. Next, I try to find places with no man-made ambient light, and always try to hide distant streetlights and building lights on the horizon behind foreground objects. Typically, my exposures run 5 to 8 minutes, and my lens aperture is f5.6. I always shoot f5.6 as a constant and adjust my exposure times around it. Clouds in the sky reflecting the moonlight require less time. Clouds blocking the moon? -- more time, way more. If you want to bracket your exposures, the duration of 1 stop under-exposure is 4 minutes, and 16 minutes for a full stop over-exposure. You will see virtually no difference between 7- and 8- minute exposures. Just like in daytime shooting, if you're shooting light-colored subjects under cloudless full moon skies, your exposure is going to be shorter than if you're shooting stuff in shadows on a cloudy night. Fill in shadows with your artificial lighting, but don't bother to waste your batteries on that white thing bathed in full strength full moon light. The moon will blow out any flashes you do there. Adjust accordingly. Experiment and make mistakes and learn from them. Don't worry if you get only one or two good shots, , you're still doing good! Here is an explanation of how this self portrait was made. I set the tripod and camera on the pedestrian bridge over Interstate 40 in Yucca, Arizona on a hot summer night a couple of days before the full moon. I used my cable release to lock the lens open. I set the lens aperture to f5.6 and left it open for 8 minutes. The first thing I did after starting the exposure was to hold the red gel over my flash and pop one on the walkway in front of me, and then another upward into the fencing above my head. I made sure that neither I nor the flash would be in the shot. Then I walked over to the fence and leaned against it and didn't move for 4 minutes. It's harder to do than it sounds, believe me! Because I was there for only half of the exposure, I am "only half there." During the 8 minutes the lens is open there are dozens of trucks and cars roaring by beneath the bridge. This is what causes the streaks of light. That leaves a few minutes for me to wait. Usually I'll scout out the next shot or just hang out and take in the atmosphere. That's it, really. 1. An inexpensive, manual exposure, 35mm camera. I use a Canon FX body that I picked up at a swap meet for $40.00. It dates from the early '60\s. Many modern cameras drain the battery whenever the shutter is open causing them to flatten their batteries in the course of 2 or 3 eight-minute exposures. Older, meterless (batteryless) manual cameras are good for night shooting also because they are almost worthless and very easy to find at swap meets and camera stores that sell used equipment. You shouldn't have to pay more than about $50.00. 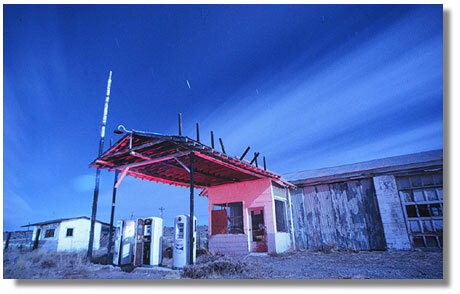 All of my work dating from 1989 to 2005 was shot on 35mm chrome film, mostly the now discontinued Kodak 160T. The post-2005 work was captured with Canon 20D and 60D DSLRs. Every image on this site was shot with wide-angle lenses. 2. Lenses. I use all wide-angle lenses (19, 24, 28mm) for night shooting as they let in more light and tend to show more sky. I also enjoy the distortion they cause. Plan to spend between $50.00 and $100.00 on the used market, per lens. 3. Cable releases are cheap ($10) and easy to lose. I once had to try and find one in Yuma Arizona on a Sunday. Always carry two. This is what you use to lock the lens open for long periods. 4. Tripod. This is what holds your camera still during the exposure. You can pick one up for about $25.00. Mine was more expensive, but it's very solid and dependable in the rough terrain and high winds you frequently find in the desert. 5. A flash is important if you want to add light to your images. This flash (a Vivitar 285) was about $100.00, but you can get by with a much cheaper unit. For several years I used a $5 garage sale flash! Bring enough batteries to refill it 3 times (or run the risk of having to make a sprint to 7-11 in the middle of the night) or see #9 below. 6. 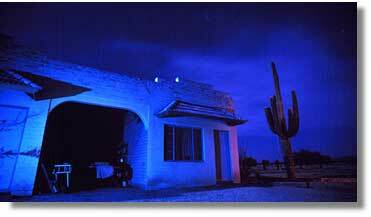 Colored gels are what I use to add color to the lighting that I add to the scene. It's hard to tell in this photo, but these items are colored, thin sheets of translucent plastic. You can buy them at a theatrical/stage supply house. It's the same material used on concert or stage-play lights. There are literally thousands of colors to choose from, but I only use red, blue, two shades of green, pink and purple. You just hold them over your light source and fire away. This stuff comes in about 3-foot-square sheets (about $7), I just cut what I need and save the rest. The stuff is easy to tear and lose, but the full sheet will last a long time. 8. A good pack to carry all this stuff. Some people prefer back packs or even those big bulky "photojournalist" vests. One of these "fanny" packs will fit all I need ($20). 9. At about $150, this Quantum battery is about the single most expensive item I use for night shooting. After many nights of trying to squeeze out the last little bits of juice from almost dead AA batteries (when the flash takes more than 90 seconds to cycle back to ready, it's time for new batteries). I felt like I was single-handedly keeping Eveready in business. Finally, I broke down and bought one of these things. Commonly used by wedding photographers, this little battery pack clips on your belt and has several hundred full-power pops stored in it. Plug it in at home for a few days, and you're ready to go again. Nowadays, I wouldn't go without one. 10. A reliable vehicle. When you head out there, you want to be able to get home. Always carry a set of simple tools and spares. Be prepared to spend the night out there. I travel in a pickup truck with a camper shell, and I just sleep on some foam in the back. Simple but comfortable. 11. Lots of water. Don't let yourself get dehydrated. Out in the desert, far from "civilization," it's easy to forget that you need to drink at least a gallon of refreshing fluid (not vodka) every day. You don't need to eat, but drink constantly. 12. A stopwatch. Even one of those funky $5 digital ones, to give you accurate exposure times. Don't try to eyeball it with a sweep second hand wrist watch. You'll make mistakes. Hell, you'll make plenty of mistakes doing night photography anyway, so it's a good idea to do everything you can to take out any unnecessary variables. 13. Patience. I've been known to hang in one isolated spot and sit and watch the stars crawl across the sky listening to the sage whisper for hours at a time. If you're easily bored and don't know what to do with yourself after 10 minutes, night shooting's not for you. Try shooting a football game or a car race. 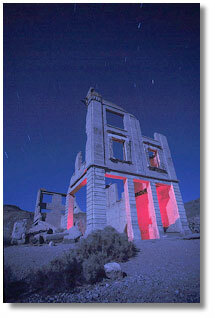 For more photos see "The Lost America night photography" web page.